And rightly so. In precisely three weeks time Wild City and mysterious new promoters Oji will be bringing the UK's preeminent dubstep duo Skream & Benga out to India for 2 dates in New Delhi and Mumbai. Few artists have had more impact in the development of 'dubstep' than Skream and Benga. Kick-starting with their first studio releases together on Big Apple Records, the two childhood and South London based wonder-kids have spent the last decade pioneering a bass heavy sound so unique that it's broken ground far from its underground London roots and into the minds and hearts of dance music lovers around the world. Together with Artwork, they also make up the groundbreaking bass music trio, Magnetic Man. Pretty simply, bass music as we know it today, owes quite a bit to this duo. Tracks such as Midnight Request Line by Skream and Night/26 Basslines by Benga hold a very special place in the hearts of those who've followed dubstep from its very beginnings. Who knows what modern EDM would have sounded like had they not started pushing these revolutionary sounds as kids. And now you’re going to be able to see them both under one roof. 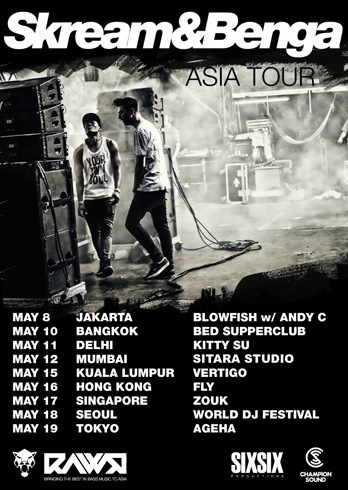 Skream and Benga are making a trek to Asia with a 9-date club tour opening in Jakarta eventually moving on to a date with Wild City in partnership with Kitty Su (New Delhi) and Oji in Mumbai's Sitara Studio.